Witches' Legacy: Awakening Darkness Collector's Edition is rated 4.0 out of 5 by 41. Rated 5 out of 5 by linzel88 from very entertaining really enjoyed playing this. a bit different to the norm and story was interesting. puzzles were engaging and challenging without being too difficult or tedious. glad I bought this game. Rated 5 out of 5 by tutortime from Great Game. Great series and this games does not disappoint. Interesting storyline and beautiful graphics. The game is very long and you get your money's worth. The CC edition was worth buying. Rated 5 out of 5 by spythere from Good Riddance to the Clumsy Imp This was an instant purchase for me: the first Witches Legacy without the ugly imp! We have a ferret instead which constantly moans and sighs, but else is droll and skittishly playful. It even knows how one skates on ice - with a snowboard! That ferret is clearly an upgrade. We play as scientist Jack Sanders - and at first it feels a bit odd. Not because I'm a woman, but because I think that a man would be less eager and probably also less gifted to stroll through a fairy-tale world and tinker with mushrooms, delicate flowers and children's toys. Jack is also a bit vain and gazes often into mirrors. But the lucky guy has two capable, female companions: Lynn's daughter Annabel and the bewitched girl Bertha, currently a ferret, help him with the magical bits and parts. I love how we can click on everything - at least in the first scenes. The little violets wink coquettishly, glassy pollen trickle from strange plants, lotus flowers croak like frogs. Be sure to tickle the fish in the aquarium BEFORE you put the cage into the water ... and don't forget to try the hellish sweets on the table ;) The whole environment is ever so entertaining, so full of little surprises and lovingly created details: A tree branch displays all four seasons together, one twig in blossom, one bears fruit, another is covered in ice. A little mouse eats Hypericum and falls asleep, but only after it yawned quite adorably. We slip into flowers, walk over clouds, dive into the subconscious mind of an old turtle, embark in a magically enlarged leaf; we encounter animated things and memories from countless fairy tales. Once, we are even downsized to the size of a gnome and find ourself on a breakfast table beside a giant fork. 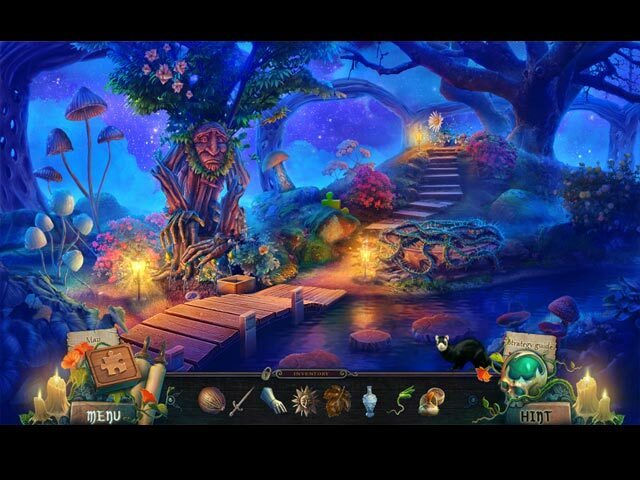 This game is like a lucky bag, replete with pixies' dreams and Alice's Wonderland, spiced with all sorts of bizarre fruits and flowers, thistles, dragonfruits, lychees, physalis, every single one true to detail. I was thrilled to recognize a rare kind of wild onion which I happen to cultivate in my garden. EleFun really has the knack with plants. The adventure is also well seasoned with humor. I had quite a laughing fit about that lanky, unhelpful watchmaker. Look at him, when he smokes the pipe of truth and rolls his eyes ... as if he had just inhaled the biggest spliff of his life. I was less impressed by the three witches. They wear identical, black pointed hats of the kind that are sold for Halloween. Represented by puppets or silhouettes, they look like spineless fashion mannequins, far too young to know anything. They have no personality and go by the names Bella, Hella and Della. Good gracious! The names did it. Somebody must have puffed one pipe of truth too many :D Challenge is alas non-existent, mini games are child's play. Well, not actually boring. 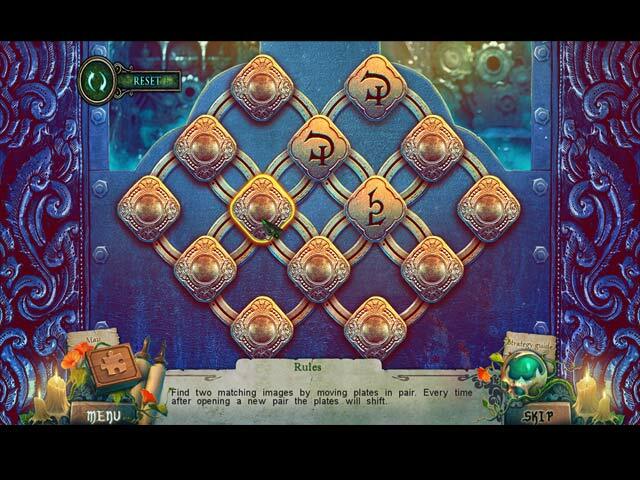 We encounter the same old puzzles, ok., but they come in new guises and are witty to play again. 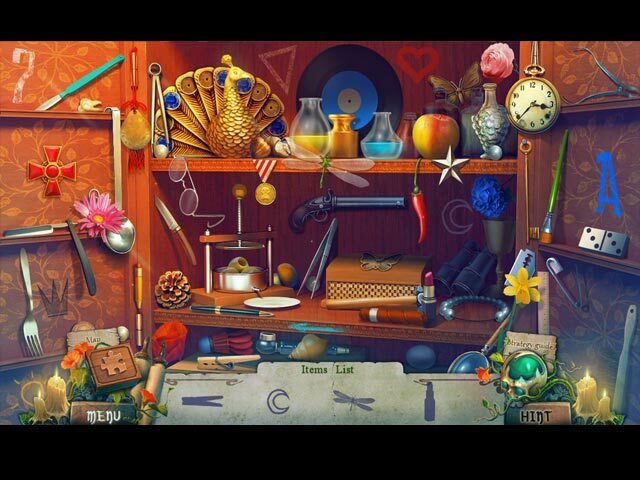 At the same time, the hidden object scenes are a sheer joy: stunningly beautiful still lifes of glamorous luminosity, most of them multi-step. That is, we find for instance eight birds and eight flowers before a list opens. Or we insert four shapes which open the items list, then four compartments with parts for the final object unlock. HOPs are varied in everything, also theme-related and well integrated into the game flow. And not least supported by gorgeous music --- which puts a spell on you. Or at any rate on me, since I tend to dawdle with the last item, just to prolong the listening.e listening. Forget Cassandra - Alexey Arkhipov is the true wizard of this game. His tracks are pure magic: imaginative, mysterious, and the best remedy against a bad temper. One tune gives me at times goosebumps on my eardrums. This composer is not even afraid to play with beats and rhythm. When did you feel the last time the urge to leap up from your chair and to dance to game music? EXTRAS: The usual wall papers, pseudo achievements and four simple puzzles which are unlocked when you collected all 36 puzzle pieces. The HOPs and mini games can not be played again; although I think this feature should be standard by now. Hence, the CE is not quite the best bargain you can get for your money. It might be worth it though for the 11 soundtracks. The BONUS CHAPTER plays in 10 scenes and lasted for me one hour and 15 minutes. It's a sequel, not necessary for a concluding end and actually just another story with the same people involved. But there are 6 new locations to discover, and I even had the impression, that one or two music tracks are exclusively heard in the bonus. I counted 9 HOPs and 9 puzzles; the collecting of collectibles continues. We play again as Jack, and again little sister Nikki is in trouble. She and Annabel are at a music festival and have been attacked by raging instruments and loudspeakers. Bertha, the girl from the 18. century, hangs still around, still wears her antique gown, however is now in possession of a cell phone. How convenient! It turns out that Cassandra's feral cat escaped and wreaks magical havoc, thus we must send the frenzied beast back to the other world. The task leads us through three magical portals and is enlivened with further variegated, enchanted things and characters; we even meet the Ghost of Oblivion from the main chapter again. An neat sequel, prolongs the fun for an hour. I was not so convinced of the cartoonish cat. As a cat lover also a trifle insulted by its vilification - but at least I had not to hurt it. Rated 5 out of 5 by drankin from Creative and surprising Kind of the same old story line, but all the visual aspects more than makes up. Not only are the graphics beautiful, but the action is full of delightful surprises, I rarely give a game 5 stars, but this one is deserves 6 just for the joy of playing. Rated 5 out of 5 by Firehorse66 from Excellent game & wonderful artwork Love these series and the artwork is fantastic. Creative places and things to do. I recommend getting all these series, so fun thank you! Rated 5 out of 5 by bekarella1 from Amazing graphics Love this series. This was by far the best one for me. I was entranced by the graphics (so very different than anything before). It reminded me of The Yellow Submarine. I can't wait to see what this developer does next! Rated 5 out of 5 by dmaxc1024 from Trust Your Instincts I was slow in buying this game after the many varied reviews. My final decision was made based on the fact that I had all the previous issues and I like to keep up with the ongoing series. I was greatly suprised in a good way after playing this one. Yes there are new characters from the ongoing series but they all tie into the story line. The technical features have been covered by other reviewers and I found all to be very good. I have found that by watching the overall ratings and using 3 1/2 to 5 stars as my barometer I am seldom disappointed. I highly recommend this game if you have enjoyed the previous ones. I only used the guide a few times to get a better explanation of the mini games. So in conclusion "Buy It"
Rated 5 out of 5 by shripch from Surprise! Good game, witches and all. I have grown weary of witches, dragons, fairies, and all the rest I long for a good hard boiled detective mystery! But this game has turned out to be a very good game for the money. Great graphics! Loved looking at all the varying scenes that kept me captivated, and throw in morphing objects, puzzles to work, and a variety of interactive HOS, and I'm hooked! Rated 5 out of 5 by fredandethel from Didn't think I'd find a series to equal Dark Parables! Occasionally there is a series which stands head and shoulders above most, and Witch's Legacy has become my new Top of the list. There is a lot of to-ing and fro-ing to collect items and use them so the map, which shows where actions are available and transports you there, is a must for me; it means I can play really relaxed and just enjoy the artwork and the unfolding story. The minigames are not challenging, they just make you think enough, and are varied and original enough, to give the whole game experience another layer. I wish A Happy New Year to all at EleFun!